Take a look at the Hayabusa Pro MMA Headgear! Hayabusa has been known to offer very high quality products and the Hayabusa Pro MMA Headgear is not an exception to this description. Honestly, it might even be the best MMA headgear specific to the sport out in the market today. Using the highest quality of 100% pure leather,the Hayabusa Pro MMA headgear takes combat sports protection to another level using the Cranial Cast Technology, giving you a customized fit. Let’s just say that overtime, it molds into your head so the fit will be specifically for YOU. Also featuring high density foam, this bad boy is sure to offer a very good amount of shock absorption. The Hayabusa Pro MMA Headgear’s ventilation system is also very good due to the fact that there are holes in the ear and over the top. And the best part? The inner lining of the Hayabusa Pro MMA headgear is second to none with it’s pseudo-suede design so it doesn’t slip around your face during live sparring, unlike most MMA headgears on the market. 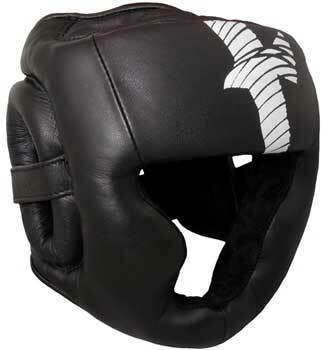 The Hayabusa Pro MMA Headgear is always available for $99.99 at MMAWarehouse.